Models have been consistent in placing storms into NE NSW for this day. Moisture feeding into the ranges combined with heating should see convection developing in this region. Perhaps some concern exists with capping as a 20 degree isotherm threatens to envelop the region. This should keep most of the action isolated if it develops. 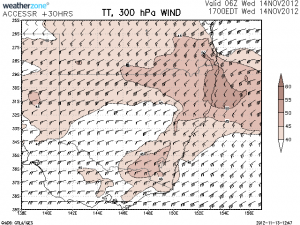 Storm potential still looking decent for the region of the mid north coast and adjacent ranges. The setup should see something drop off the Dorrigo to Glen Innes ranges into the Clarence Valley – hopefully a long-lived severe storm or two will track through the Northern Rivers. I hope the cap can hold off until I finish work and get the car about 5:30, I doubt I will be that lucky however? Actually Kane, did you get any action – your wish was granted and the cap held until very late! Lots of lightning by the looks! Hey Jimmy I did see lightning and hear thunder so i’m certainly not complaining, most of it wasnt visible enough to shoot however. I couldnt really see much due to low level cloud. Kane Hardie, that is an excellent picture with structure that caught my attention immediately! I can see the high bases and the structure with cow catcher appearance trying to tap into the lower level moisture! Michael Bath, did anything appear in your vicinity? Lots of lightning on lightning tracker. Here’s some photos of the storms through the Clarence Valley Wednesday. I was on chase with Jason Paterson. Weak cells coming across the ranges from the southwest managed to become severe as they hit the better moisture. Actually Michael Bath and Kane Hardie, I actually like the way the moisture is interacting in all your images and bases begin to lower! Nice pics MB, the base of my storm looked nearly identical to this about 10mins before the shot I posted. I’ll post another pic when I get off work :)..It did have some cool structure hidden in there to bad it was visible earlier when the storm was in better shape. Its looking pretty interesting up north on Saturday I must admit! Nice low pressure trough, almost looks like a reasonable dryline setup over the eastern NWSP and western NT's?